Hare Krishna Land (ISKCON Juhu) is set upon four acres of prime land and is a stone throw away from Juhu beach. A.C. Bhaktivedanta Swami Prabhupada, founder of ISKCON, inspired the construction of one of India’s most beautiful temples for Lord Krishna in Mumbai. 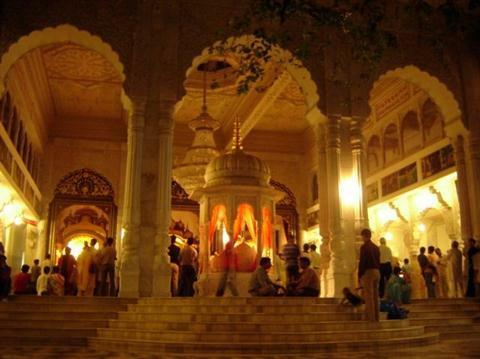 The presiding Deities at the temple are Sri Sri Gaura-Nitai, Sri Sri Radha Rasabihari and Sri Sri Sita Rama Laxman Hanuman. The Deities were personally installed by His Divine Grace A. C. Bhaktivedanta Swami Prabhupada. A. C. Bhaktivedanta Swami Prabhupada: His Divine Grace A. C. Bhaktivedanta Swami Prabhupada, Founder-Acharya of International Society for Krishna Consciousness (ISKCON), was born Abhay Charan De, on the 1 September 1896, in Calcutta. In 1922 he met His Divine Grace Bhaktisiddanta Sarasvati Thakur, Founder of Gaudiya Math, who requested Abhay to broadcast Vedic knowledge in the English medium. In 1933, at Allahabad, Abhay was formally initiated and made it his life’s ambition to expound the Vedic edict that real freedom means liberation from the miseries of material life : birth, death, old age and disease, a state that can be permanently attained by awakening one’s pure love for God, Krishna-prema or Krishna-bhakti. In the ensuing years Abhay Charanaravinda (his initiated name), wrote a commentary on the Bhagavad-Gita. In 1944 he started the Back to Godheadmagazine, which to this day is being continued by his disciples. In recognition of his philosophical knowledge and devotion the Gaudiya Vaishnava Society honored him with the title Bhaktivedanta in 1947. Following his retirement from married life, A.C. Bhaktivedanta traveled to Vrindavan where he lived in the humble surroundings of the Radha Damodar temple. In 1959 he took the sannyasa order of life and, as A.C. Bhaktivedanta Swami, started his work on the multi-volume translation and commentary of the 18,000 verse Srimad Bhagavatam. In 1965, at the age of 69, when ordinary persons are thinking of retirement, he went to the United States to fulfill the mission of his spiritual master and founded ISKCON. Srila Prabhupada, (as he was affectionately called by his followers), taught on a non-sectarian level that every living being is an eternal servant of Lord Krishna with a dormant natural propensity to experience the eternal bliss of pure love of God. He brought to the West the divine teachings of Lord Caitanya Mahaprabhu who taught the public glorification of Hare Krishna mantra. Srila Prabhupada was not ‘just another swamji’ starting ‘just another movement’. The standard of purity and dedication he demanded of his followers testifies to his genuineness, as well as his unwillingness to compromise for the sake of having many admirers. By 1977 when Srila Prabhupada left this world in Vrindavan he had completed over 70 volumes of authoritative translations and commentaries including the Bhagavad-gita, Srimad Bhagavatam, Caitanya-caritamrita and several Upanishads. These literary contributions are today highly respected by the academic community for their authoritativeness, depth and clarity. Srila Prabhupada’s works have been translated into all the major languages of world and are used as standard textbooks in college courses. Srila Prabhupada also brought India’s cultural and religious festivals, such as Ratha-yatra to the West. Srila Prabhupada continues to live up the reputation as a spiritual revolutionist who instilled in many millions Krishna-prema. His Divine Grace A.C. Bhaktivedanta Swami Prabhupada is considered as India’s foremost spiritual ambassador. It was through his spiritual dedication and unprecedented achievements that India’s cultural richness was introduced in the West and is now practiced, throughout the world. In the early 70’s when Juhu was considered a remote and obscure part of the city, to envision a temple rising here was beyond anyone’s imagination. However, fighting against many odds Srila Prabhupada acquired the Juhu property (which is presently Hare Krishna Land) and promised Sri Sri Radha Rasabihari Deities who were then housed in a small shack “My dear Sir, please remain here, and I shall build a beautiful temple for you”. Srila Prabhupada requested his disciples to construct a silver and teakwood simhasana for Sri Sri Radha Rasabihari on a marble altar and that their temple should have marble domes more than a hundred feet high. Today the magnificent temple complex is one of the most visited in the country. It is a spiritual oasis in the dry and demanding material life of the financial and commercial capital of India. Opened in 1978, the complex includes a spacious marble temple, a recently renovated auditorium, a huge restaurant and a twin towered seven-storey guest house where visitors can stay and participate in the daily spiritual programs of the temple. In India, Srila Prabhupada’s main program for revitalizing the Vedic teachings was the construction of major temples. In 1972, he laid the foundation stone of the temple in Juhu, Mumbai. Opened in 1978, ISKCON Juhu has become a must visit pilgrim center with nearly 25000 pilgrims streaming in daily. ISKCON Juhu conducts several projects for spiritual, educational and cultural upliftment of all sections of society. These programs include distribution of free meals (Food for Life), workshops and seminars, yoga retreats, distribution of spiritual literature and much more. However, over the years ISKCON Juhu lacked sufficient space and infrastructure to accommodate the increasing number of people interested to participate in these events. ISKCON Juhu’s Heaven on Earth project fulfills these needs and helps one to elevate his spiritual consciousness. The very name ‘Heaven on Earth’ was given by Srila Prabhupada. In a letter to Giriraja Das, dated 21 June 1972, Prabhupada had mentioned “I always think of our Juhu place, and I want that it shall be the model for the world to emulate and respect as the perfect example of Krishna Conscious community”. 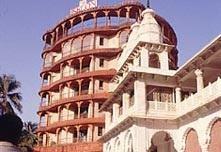 In 1995, ISKCON Juhu Temple Management Council formed the Sri Sri Radha Rasabihari Committee (SSRRC) to help implement the Heaven on Earth project. The SSRRC members, who are prominent members of society, helped the project in terms of advice, funds and management. The construction took little more than 2 years and the project is now open to the citizens of Mumbai. Center for Vedic Education: The Center for Vedic Education conducts Stress Management workshops, yoga retreats, research cell and Vedic education and courses based on Bhagavad-Gita and Srimad Bhagavatam, including the Bhakti-vriksha program. Govinda’s Restaurant: One can enjoy karma-free food, both physically and spiritually nourishing, at Govinda’s restaurant. Prasadam at Govinda’s is prepared from carefully chosen ingredients and offered to Lord Krishna, which makes you healthy and peaceful. The present Govinda’s is almost three times larger than earlier and offers an extensive variety of meals and snacks. Library: The Heaven on Earth complex houses a spacious library which not only has an extensive collection of spiritual books but also a multi media section. One can watch ISKCON’s many international videos and relish hundreds of lectures, kirtans and bhajans. The library contains the entire encyclopedia of Vedic literatures and publications of the Bhaktivedanta Book Trust, the world’s largest producer of Vedic literatures. Guestrooms: Apart from the existing 40-room guesthouse the Heaven on Earth project has an additional 40 guest rooms. One can have the privilege of staying in a temple atmosphere, partaking in temple programs and prasadam to gain a totally spiritual enlivening experience away from the hustle and bustle of daily life. Vedic Samskara Hall: The Vedic Samskara Hall is available for vivaha yajnas and any such Vedic samskaras and celebrations. This facility is elegantly designed with a large space and large dining hall. The Samskara hall offers a rare and sacred privilege of performing auspicious functions in Lord Krishna’s beautiful temple. Spiritual Boutique: A shopping section for your body and soul packed with spiritual paraphernalia from books to audio cassettes, VCDs and DVDs to traditional garments, paintings of Lord Krishna, diaries and puja items. IYF (ISKCON Youth Forum) is a program specifically tailored for present day youth. Youth are in the peak of their lives and have a tremendous enthusiasm for understanding anything which interests them. IYF encourages youth to achieve the ultimate understanding in this period of life, so that whatever else they may wish to learn or acquire – they can do it easily. IYF is meant to help the youth in the critical stage of their lives to attain stability and permanent happiness through the dissemination of Vedic culture and way of life. All efforts in IYF are directed towards this purpose. IYF helps youth achieve this goal by conducting various courses, seminars, presentations and group discussions on Bhagavad-Gita, Srimad Bhagavatamand Vedic philosophy and teaching their scientific application in daily lives. It gives complete knowledge of the advanced principles of Vedic life. On convenient days like weekends or public holidays, IYF arranges for such programs. The youth also get an opportunity for interacting with serious practitioners of Vedic culture, thereby giving a different understanding to the way in which we lead our lives. A 3 session Bhagavad Gita course especially for students every month (discover yourself, does god exist, yoga and different yoga systems). An advanced course in application of Bhagavad-Gita relevant to youth life called BHAKTIVRKSHA (weekly). Camps & Retreats (every 3 months). Spiritual tours to holy places (yearly). Conducting workshops on various skills and crafts including playing musical instruments, singing, jewelry designing, making flower garlands, painting Deities, vegetarian cooking, stitching outfits, etc. Performing dance and drama depicting Lord Krishna’s pastimes. Provide a platform for harmonious and caring relationship amongst its members. Voice opinions, discuss problem areas and share inspiring news. Discussion on ancient Vedic scriptures like Bhagavad-Gita and Srimad Bhagavatam. VAST is a training division of ISKCON, Juhu, has its World Headquarters situated at Hare Krishna Land, Juhu in Mumbai. Its vision is to be recognized as the best provider of spiritual technology in the fields of management and education. VAST is committed to making a positive difference in educational institutions and at the workplace through professionally supported programs. VAST will provide spiritual technology based on the time-tested Vedic model to achieve the highest potential in personal and professional relationships. VAST will use Vedic solutions for resolving contemporary issues. VAST will continuously improve training standards to create leaders for tomorrow. Disseminate Vedic knowledge to educate society at large in the techniques of spiritual life in order to check the imbalance of values in life and to achieve real unity and peace hereby. Providing training and development to improve human productivity and efficiency by synergizing timeless Vedic wisdom with modern management principles. Distributing educational literature to serve the aforesaid objective in the form of books, multimedia CDs, magazines and/or any other media for developing leadership qualities. • Personal Excellence through the Bhagavad-Gita. • Relationship Management… and many more. VAST is led and managed by professionals and advised by industrialists.